An exclusive Universal Music Korea Artist, Sung-Won Yang has appeared all over the world as a soloist and as a chamber musician. He has given highly acclaimed solo recitals and performances in prestigious concert halls such as the Alice Tully Hall at New York’s Lincoln Center, the Salle Pleyel in Paris, the Concertgebouw in Amsterdam, the Terrace Theater at the Kennedy Center in Washington D.C, the Opera City Hall in Tokyo, the Symphony Hall in Osaka, and the National Center for the Performing Arts in Beijing. His performances have also taken him to other major cities such as London, Rome, Frankfurt, Madrid, Prague, Helsinki, Boston, Seattle, Tel Aviv, Shanghai, Sydney, and many others. As a former exclusive artist for EMI Korea, his all-Kodaly debut album was chosen as Editor’s Choice of the month by Gramophone Magazine (Feb. 2003), Critic’s Choice of the year for also by Gramophone Magazine in the UK (Deb. 2003), as well as being nominated as best solo debut album at the Edison Awards in Holland (2003). His other recordings for EMI feature works by Rachmaninoff and Chopin with pianist Ick-Choo Moon (2002), recording of complete Bach Solo Suites (2005), and the complete Sonatas and Variations for Piano and Cello by Beethoven with Pianist Pascal Devoyon (2007), which were all released to immense positive responses and have met a huge success among music lovers and critics alike. In addition to his Schubert Album with violinist Olivier and pianist Emmanuel Strosser released by Decca Label (2009), his recent recording of Dvorak’s Cello Concerto with Czech Philharmonic Orchestra and Dumky Trio is to be released in the fall of 2010 through Universal Music/Decca as well. 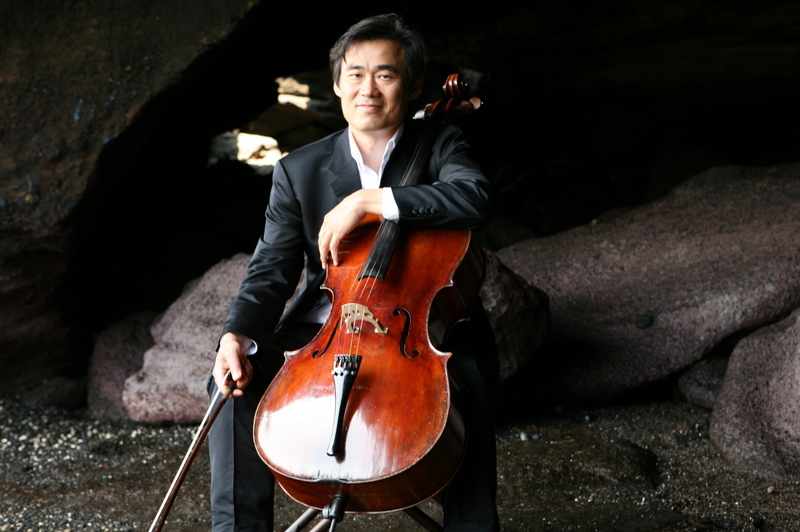 Sung-Won Yang has collaborated with musicians such as Christoph Eschenbach, MyungWhun Chung, Yuri Bashmet, DongSuk Kang, Nobuko Imai, and Pascal Devoyon, among many others. His performances of the Saint-Saens Cello Concerto, Brahms Double Concerto, and Tchaikovsky’s Variations on a Rococo Theme with the Orchestre Symphonique Francais were broadcasted on French National TV and all over Europe through Eurovision, and they are available on DVDs by Goldline Classics. Furthermore, he has given numerous live broadcasts on France Musique, NHK of Japan, and KBS of Korea. As a frequent performer of contemporary music, he regularly commissions new works such as a trio for Violin, Cello, and DaeGum (Korean traditional Wooden flute) by Korean-American composer JeeYoung Kim (2006) and a trio for Piano, Violin, and Cello by French composer Pierre Charvet (2006), which was premiered in Saint-Nazaire and Paris.